The 19th-seeded ’88-’89 Calgary Flames and the 23rd-seeded ’79-’80 Buffalo Sabres both came into the Semifinal in the top 5 in goals per game and in the top 10 in goals allowed per game. So it has the the makings of a very even series and if this Game 1 was any indication of what the series will be like, it’s going to be fantastic…..if a fake, not real series can be fantastic. The opening frame was very even and only a goal in the final minutes of the period from Gilbert Perreault, his 18th of the tournament, gave Buffalo the edge. Center Jiri Hrdina tied the game for the Flames about seven and a half minutes into the second period with his 5th goal of the tournament. An elbowing penalty on Sabres defenseman John Van Boxmeer gave Calgary a chance to take the lead late in the second, but were unable to capitalize. The Flames went 0-for-4 on the PP in Game 1. Van Boxmeer made up for his penalty with a goal just over four minutes into the third period to give the Sabres a 2-1 lead. Almost four minutes later, Calgary notted it back up with a goal from Hakan Loob, his 18th of the tournament. The Flames got another PP opportunity after a charging penalty on Rick Martin, but as I said earlier, the Flames were o-fer in this game on the PP. The game went into overtime tied 2-2, but the overtime period didn’t last long. 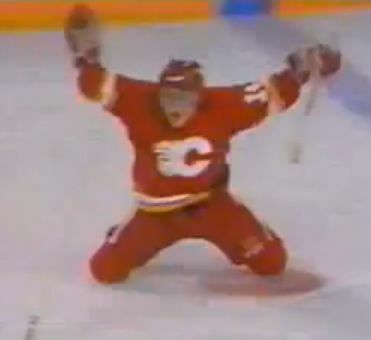 Theoren Fleury potted the game-winner just over five minutes into the overtime period. The game finished with the two teams posting the same number of shots on goal and nearly the same time of possession. Game 2 will be Friday night! Game 2 of the Semifinal matchup between the top-seeded ’76-’77 Montreal Canadiens and the 4th-seeded ’73-’74 Boston Bruins with Les Habitants up 1-0. This entry was posted in Semifinal, Ultimate NHL Playoff and tagged Boston Bruins, Gilbert Perreault, Hakan Loob, Jiri Hrdina, John Van Boxmeer, Montreal Canadiens, Rick Martin, Semifinal, Theoren Fleury, Ultimate NHL Playoff. Bookmark the permalink.